Change lives - be a Food Pantry volunteer! Help feed your community! 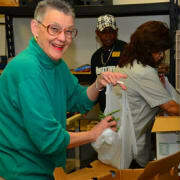 Volunteers at Wilkinson Center's Food Pantry help clients pick out food, bag items, and carry bags to cars as needed. Additionally, volunteers help restock the pantry shelves, bag produce, and unload new donations. This is a great volunteer opportunity for regular weekly volunteers or volunteers looking to give back as-needed. The pantry is open Monday, Wednesday, and Thursday from 9 AM to 12 PM and on Tuesday from 1 to 4 PM. We especially need volunteers on Tuesday afternoons and on Thursday mornings. Volunteers must be 16 years of age or older to volunteer by themselves or 12 years or older to volunteer with a parent. Regular weekly or biweekly volunteers are especially appreciated. For more information or to get started, please contact Laura_ingrim@wilkinsoncenter.org or 972-284-0305.